Debra Reinhart, Pegasus Professor and assistant vice president for Research & Commercialization, has received the 2014 Stanley E. Kappe Award for extraordinary service in advancing public awareness of the betterment of the environment. 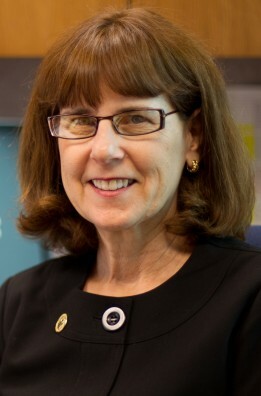 In addition to her extensive experience at UCF, where she received her bachelor’s degree in environmental engineering and has served in administrative roles ranging from executive associate dean of the College of Engineering and Computer Science and interim dean of the NanoScience Technology Center, she has worked in the private sector. She served as a consulting engineer for companies in Atlanta and was chief of the research & development division of the Bureau of Pollution Control in that city. From 2011-2013 Reinhart served as the Environmental Program Manager at the National Science Foundation (NSF) in Washington, D.C. where she reviewed proposals and worked with universities across the country to achieve the agency’s goals. She received her master’s and Ph.D. degrees from the Georgia Institute of Technology and her research in solid waste management focused on optimized waste collection and sustainable operation of landfills has been supported by both government agencies and private companies. She is a co-PI on UCF’s STEAM project, an innovative five-year effort to match UCF scientists and students in Science, Technology, Engineering and Mathematics fields with student artists to interpret science through art. The project is funded by NSF. She has served on numerous professional boards and is a registered professional engineer in Florida and Georgia and is a Fellow of the American Society of Civil Engineers and the American Association for the Advancement of Science. The Stanley E. Kappe Award was established to honor the man who served the American Academy of Environmental Engineers & Scientists as executive director from 1971-1981.